Utopia Pet Lodge will close and be converted in to a municipal pound in a major overturn of a previous Baw Baw Shire decision. A report outlining options for the Longwarry North property was presented to councillors on Wednesday night. Officers recommended council undertake a tender process to construct a new pound on the property… at an estimated cost of $741,000. The report also suggested officers prepare an annual report on the operations of Utopia, despite year to date financials showing the pet accommodation facility was running at a loss. Instead, Cr Goss moved council shut down Utopia and convert the facility to an animal pound. “Sometimes I think its better to admit fault and admit the decision making was wrong. “We need to fix this mess we have inherited. It is not our business to be running this. It is running at a loss and it wasn’t when it was purchased,” he said. Cr Goss had called for the figures to be released and it was disappointing that had not happened. “I haven’t seen a business case here that satisfies me,” he said. Cr Jessica O’Donnell said she could not justify running a business that council could not release information on. “We are not the owners of the documentation the public wants to see. But I don’t feel comfortable running a business without the transparency that the public deserves,” she said. “It is an insidious situation and we have to move forward and get the best outcome for the community,” he said. 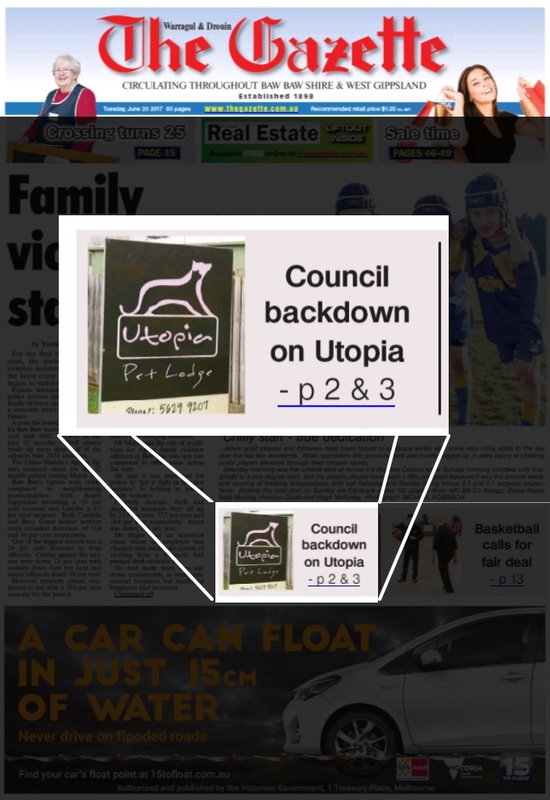 Baw Baw Council has estimated that a retrofit of the Utopia facility will cost around $350,000 to ensure the Utopia facility is compliant with pound regulations. Council will see tenders for the works to create more dog and cat pens than currently available at Galloway St, with potential for future expansion. These changes in council's policy have been driven largely by a dedicated team of local animal advocates and ratepayers agitating for better outcomes and care for the community's pets. 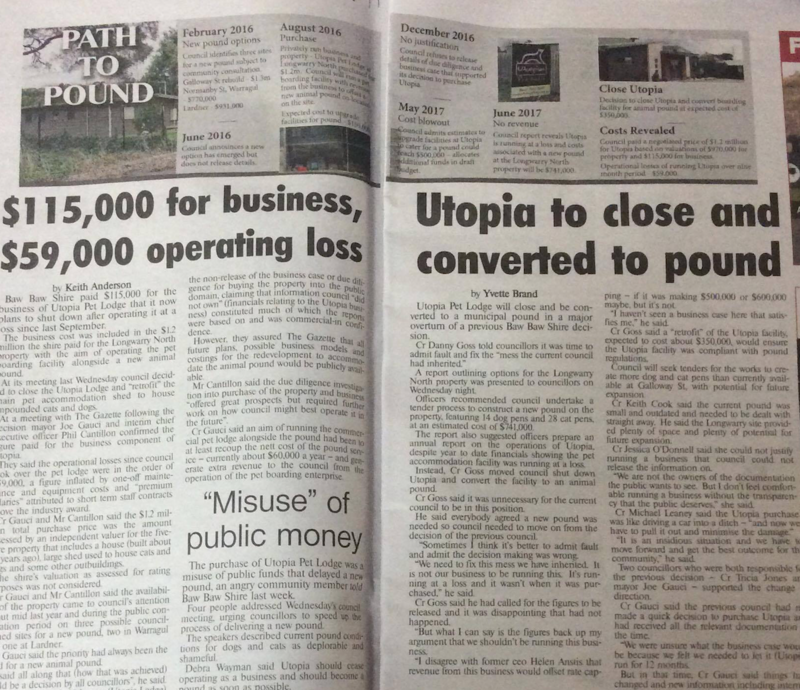 Debra Wayman said Utopia should cease operating as a business and should become a pound as soon as possible. Do what you have to do to get it up to scratch and get our animals out of that (old) pound. .... (She) suggested council could also consider establishing a rescue shelter on the site where local volunteers could assist with animals to be rehoused. Everyone involved in bringing council to their senses through this community action, should be congratulating themselves tonight on a fight, well fought. This is the best result anyone could have hoped for - well done all. June 7, 2017 - Cost to get Baw Baw a new pound is... wait. How much?